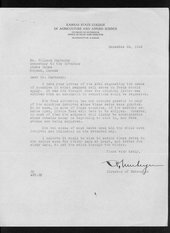 Summary: This is the correspondence of Governor Alfred M. Landon on drought conditions in Kansas between 1933-1936. The correspondence proceeds in reverse chronological order within each folder. The governor's response is usually filed with the original letter.